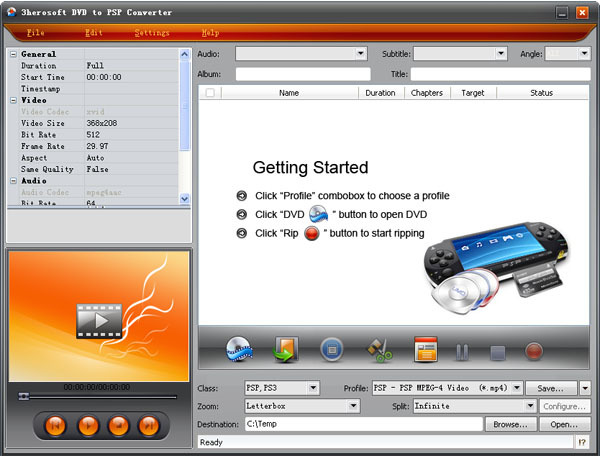 3herosoft DVD to PSP Converter is powerful and easy-to-use DVD to PSP and DVD to PS3 converter software, which can not only convert DVD to PSP MP4, PSP H.264/MPEG-4 AVC, PS3 MPEG-4, PS3 H.264/MPEG-4 AVC High-Definition(480P,720P and 1080P) Video formats but also extract audio track from DVD to MP3, AAC audio formats with high sound and image quality. It make your PSP player a wide screen movie player with 3herosoft DVD to PSP Converter! ...... audio bitrate, adjusting resolution, setting frame rate and so on. It is so convenient to put your favorite movies in your PSP and watch them on train, plane, or automobile anytime. make your PSP player a wide screen movie player with 3herosoft DVD to PSP Converter! Qweas is providing links to 3herosoft DVD to PSP Converter 3.5.8.1206 as a courtesy, and makes no representations regarding 3herosoft DVD to PSP Converter or any other applications or any information related thereto. Any questions, complaints or claims regarding this application 3herosoft DVD to PSP Converter 3.5.8.1206 must be directed to the appropriate software vendor. You may click the publisher link of 3herosoft DVD to PSP Converter on the top of this page to get more details about the vendor.